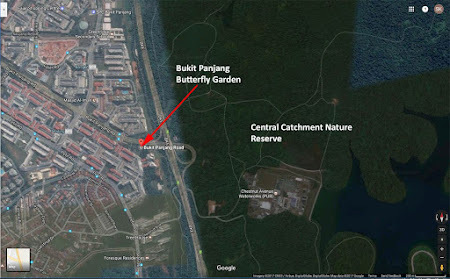 Located in the north-west of Singapore, Bukit Panjang, formerly called Zhenghua, is home to about 140,000 residents. Pre-independence, Bukit Panjang consisted of mainly rural settlements and agricultural farming. Over the decades, Bukit Panjang has developed from a largely agricultural and industrial area to a highly urbanised and self-contained town, as kampung folks and farmers were re-housed in new Housing and Development (HDB) flats. Despite these changes, much of the area’s terrain and greenery have been preserved to form a unique blend of urban and rural space. 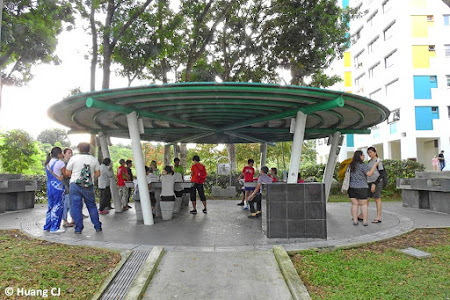 The area retains its strong connection to nature through the neighbouring Bukit Timah Nature Reserve to the south and the Central Catchment Nature Reserve to the east, both of which contain rain forests. 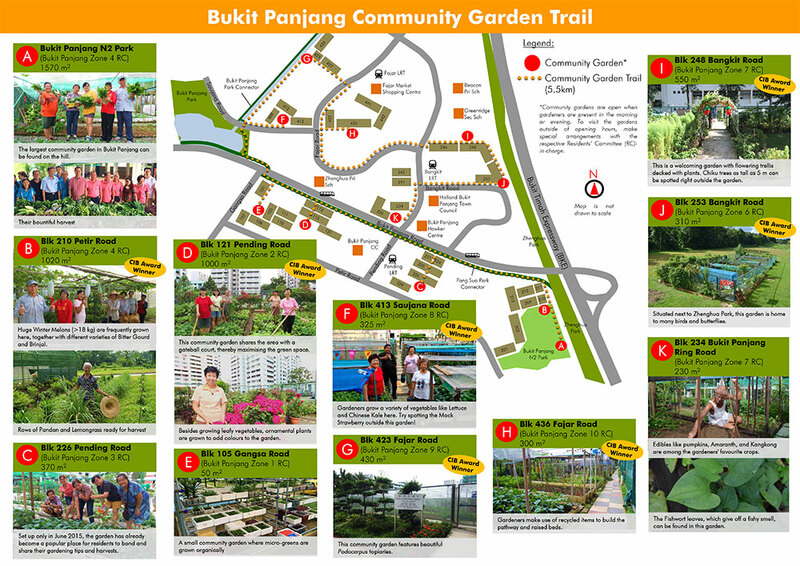 In recent years, the National Parks Board's (NParks) Community in Bloom programme worked with the residents to bring back the kampung spirit in the form of community gardens. Residents and volunteers are encouraged to set up gardens where they can bring back their past activities as well as bond with their neighbours and friends living around the precinct. 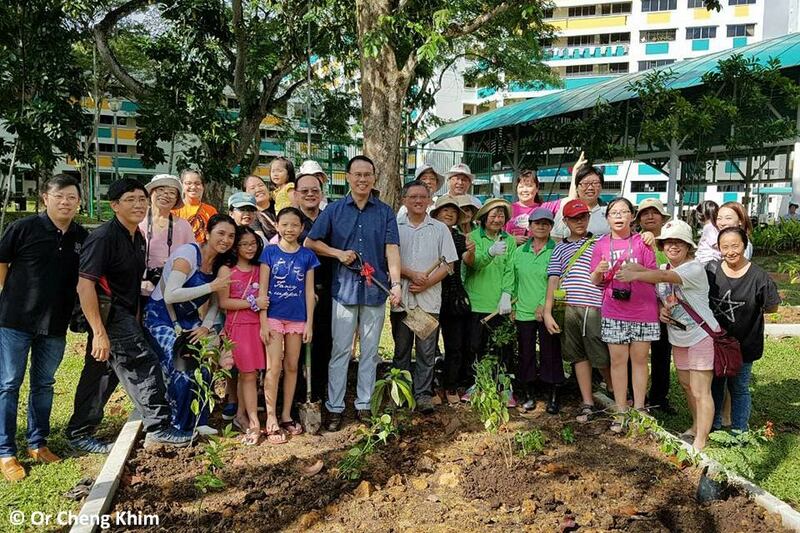 Bukit Panjang constituency is home to more than 11 community gardens specialising in edibles and medicinal herbs. 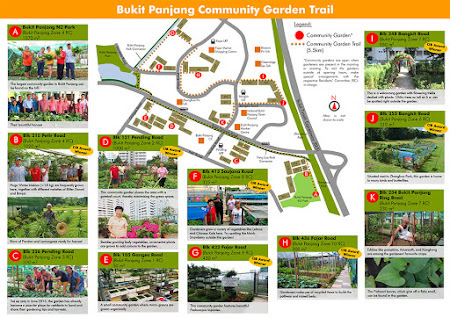 The Bukit Panjang community gardens have a large variety of vegetables and fruits which are grown by community gardeners who work together to keep the kampung and gotong royong spirit alive in modern Singapore. 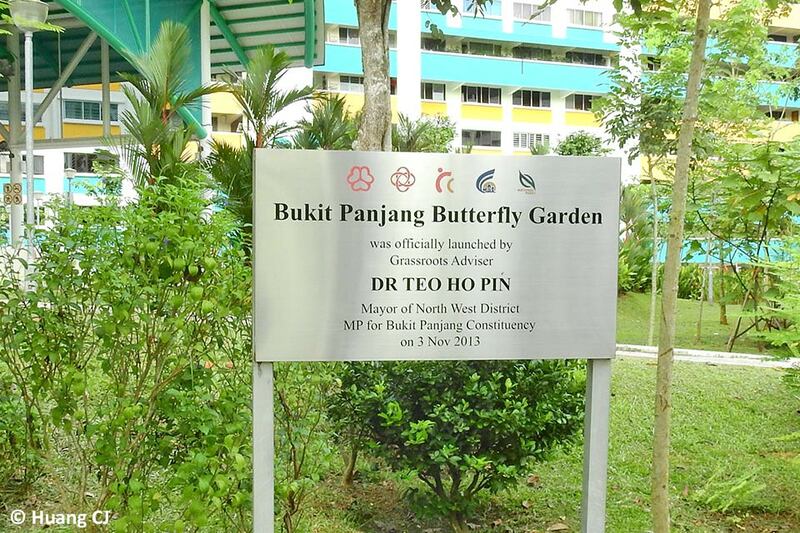 Tucked in between two of the community gardens along Bukit Panjang Road, a small butterfly garden was set up in 2013. Championed by grassroots activist Sussie Ketit and her team of volunteers, the butterfly garden led a low profile existence with about 10-15 species of butterflies regularly seen at the garden. This year, Sussie approached Foo JL of Seletar Country Club Butterfly Group for his assistance to expand the Bukit Panjang Butterfly Garden (BPBG). A site visit amongst our group of butterfly enthusiasts and the Mayor of North West Community Development Council (CDC), Dr Teo Ho Pin in March this year, initiated plans for the expansion of the original BPBG. The group, ably led by Foo and his volunteers, Sussie and Sebastian Chia, and landscape contractor Tian HM set out to plan BPBG 2.0. The Town Council and a group of volunteer gardeners chipped in to help as well. The plans took shape as the planter beds were constructed and topsoil added. Butterfly host and nectaring plants were prepared and readied for the planting day planned for Jun 2017. 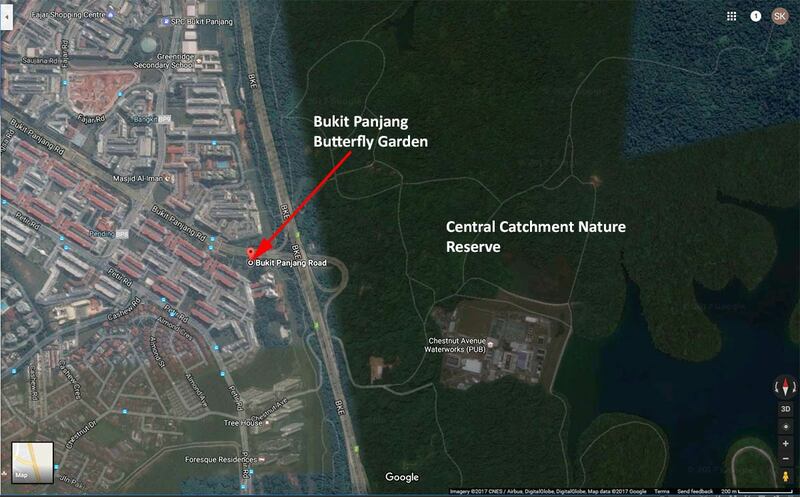 The Bukit Panjang Butterfly Garden 2.0 Community Planting Day started early on Saturday 3 June. Foo JL and Cheng Khim were on hand to brief the community volunteers and gardeners about butterfly plants and the caterpillars of butterflies that feed on them. Cheng Khim helped to brief the non-English speaking participants and everyone enjoyed the show-and-tell session with live caterpillars and information about plants that attract butterflies. Working hard at planting butterfly plants! The group then went to the various planting beds that were already prepared with many butterfly host and nectaring plants. A final briefing by Tian on how to properly dig a hole and place the plants gently into the soil, everyone was raring to go. Armed with spades, shovels and changkuls, the volunteers, young and young-at-heart, helped to fill the planters with their selected plants. Despite the hot and humid morning, everyone had a lot of fun digging and planting the various host and nectaring plants. The rather ad-hoc placement of the plants is typical of a natural butterfly garden habitat, where the landscape design allows for a more natural look, rather than a horticultural display of organised and manicured planting. Mayor Dr Teo joined in the planting exercise and he energetically planted a Red Tree Bush (Leea rubra), a butterfly nectaring plant, right in the centre of the "VIP" planter bed. The local gardening community ladies also joined in to help Mayor Teo make sure that the plants were well watered. Foo JL brought some butterflies for Mayor Teo to release, to mark the event. The morning ended with a nice buffet (like all things Singaporean, there will always be good food at such gatherings), generously sponsored by Sussie. After the hard work, everyone was in high spirits and looking forward excitedly to more butterflies at BPBG in the coming months. The BPBG is situated along Bukit Panjang Road next to Block 213/214 Petir Road. 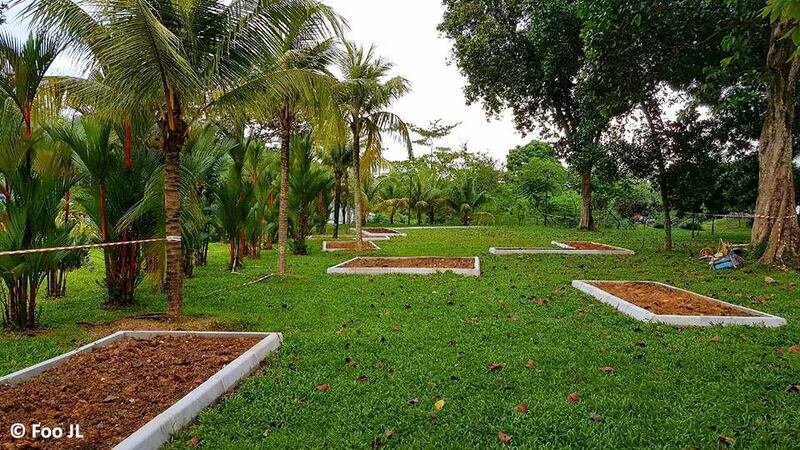 The site is quite ideal, as it is linked to the Pang Sua and Zhenghua Park Connector network that links to biodiversity-rich areas like Dairy Farm Nature Park and further south, the Bukit Timah Nature Reserve. Its immediate proximity to the forests of the Central Catchment Nature Reserves is also advantageous, as a concentration of nectaring plants may attract some forest butterflies along the edge of the reserves to fly over to feed. The next generation. A bunch of eggs and caterpillars of the Three Spot Grass Yellow (Eurema blanda snelleni) found at the BPBG. Very soon these pretty yellow butterflies will be fluttering around at the garden! And so BPBG has been planted and good to go. 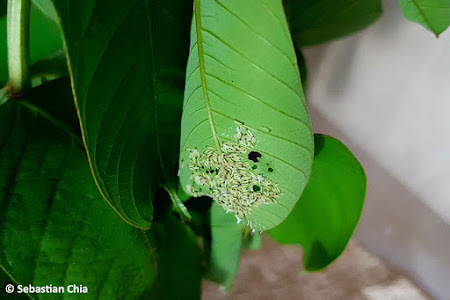 It has 'pupated', waiting for the plants to grow, and for the flowers to bloom and attract butterflies. Its metamorphosis has started, and we will wait for a couple of months to see the fruits of the community's labour. 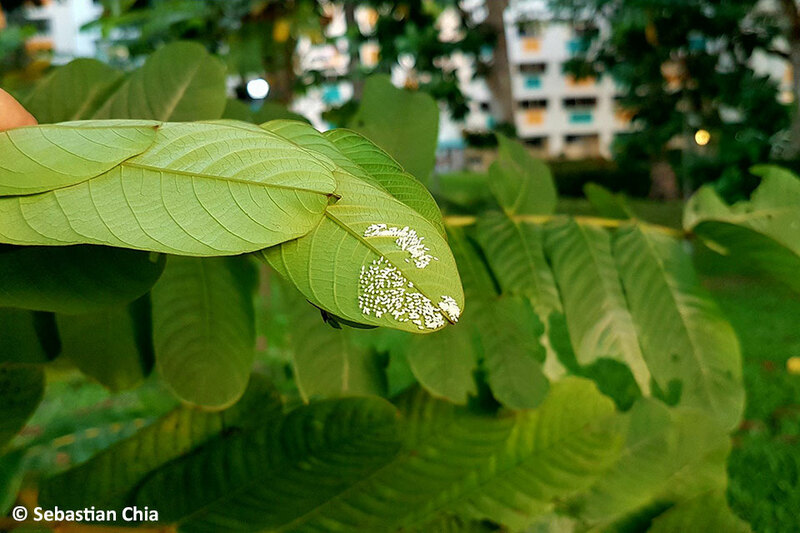 Hopefully, we can encourage more butterfly enthusiasts to enjoy butterflies and conserve the environment that is conducive for our winged jewels to survive for our future generations to enjoy them. Text by Khew SK : Photos by Sebastian Chia, Foo JL, Huang CJ, Sussie Ketit, Khew SK, Or Cheng Khim and Rita Dumais Sim.